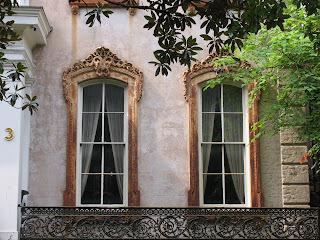 When Savannah was founded in 1733, General James Oglethorpe laid out the city around four open squares. With the population growth through the 18th and 19th centuries, an additional 20 squares were added. 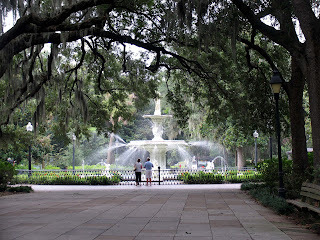 Although the squares were initially used for military exercises, they are now used as small parks and are one of the reasons why Savannah's historical district is such an urban jewel. Three of the original parks were lost in the 20th century. 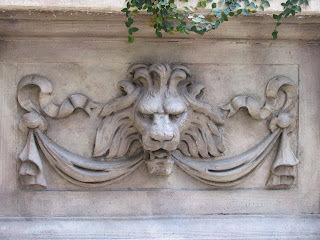 One of these, Ellis Square, is currently being recovered. To me, it still looks like a mess however. Most of the squares are tributes to war heroes or prominent politicians. 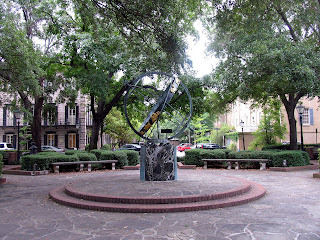 Troup square is located about a minute from where I live. 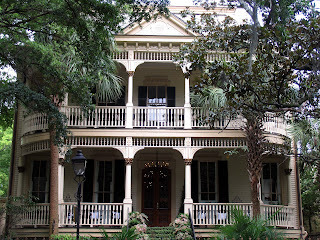 It was laid out in 1851 for Georgia Governor George Troup. 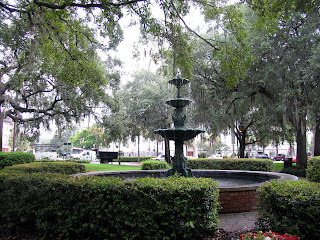 All the parks seem dog friendly and Troup Square even has its own dog fountain. Madison Square. It memorializes Sgt. William Jasper who was a war hero in the Siege of Savannah. Some people call it Jasper Square which would make a lot more sense. I'm not sure what square this actually is. I was walking around rather aimlessly and took a lot of pictures. 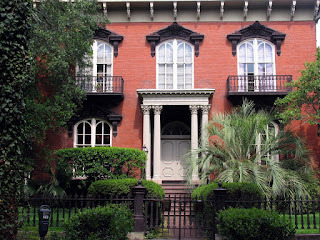 This is the Williams Mercer House, the site of the infamous murder as described in the book, Midnight in the Garden of Good and Evil. Pictures do not do this home justice. You'all just have to come down and see it for yerself. This group of squares is the largest urban National Historic District in the country. For good reason, the architecture is stunning. 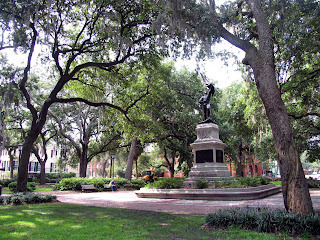 And finally, we come to Forsyth park, the largest park in the historical district. This is a great place to jog, walk your dog, daydream or just be homeless. Its centerpiece is a massive fountain at the end of a very long walkway. I have been tempted to go swimming in the fountain but I'm sure that is frowned upon by the tourist board.